Cynical,…are you admitting that there was a “scam” all along ??? If not,…why you use the word “sabo King” ??? You don’t use the term “Sabo” to describe someone,…unless,..unless that someone “screwed up” your plans , rite. So, essentially,…you are “admitting” that there was a “scheme to short changed” those innocents , rite ? If i m not mistaken…. 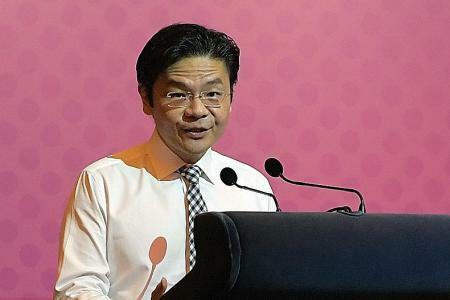 lawrence wong is from the former Tanjong Katong Technical School. Used to play soccer on big open field (4 schools there @ that time) against his team in sec school. pap pai kar said CPF money is not our money. WTF. CPF cunningly switch automatic to 70 and start at 65 must indicate when it should be automatic at 65 and indicate at 70.
inside 200m is not within 200m. S$600k per year is peanuts. S$1,000,000 per year is mediocre. 70% sheep median wage is less than S$3,500 GROSS per month. if 70% sheep continues to vote into power folks who do NOT serve 70% sheep but rather enrich themselves with more than peanuts money with more than mediocre mowny then 70% sheep no hope. worse 70% sheep harms their own offspring by their stupid action. this truly is the WTF of everything wrong in once great Singapore. CI, it won’t work. Wayang before election is no more captivating; promises before election can be broken and trust for the leaders is lost beyond recovery. ==============================================================================but many more who come from ELITIST SCHOOLS SHOW SIGNS OF INCOMPETENCY? Sacking Wong won’t solve the issue and we all know it. He is merely a puppet and has to try his best to convince flat “owners” that their flat is an asset, that it will go up in value etc etc. Even if he was sacked the next joker to replace him will say the same things all over again. And if home buyers are smart enough to think then not many will want to buy a HIP2 flat either. A HIP2 flat may look newer but it will be at least 60 years old by then, who is going to be so dumb to buy a flat with 39 years of lease left? You really think the flat’s value will jump just because it’s been HIP2 ah? Buyers will look at how many years of lease are left, not whether a flat has been HIP2 or not! Let me put it this way, would YOU buy a HIP2 flat with less than 40 years of lease left? As long as papies are in charge, your hdb is fucked. You expect them to compensate you $500,000 at the end of 99 yrs? Or give you free replacement flat? 96% of all hdb will expire worthless. Everybody knows this, that’s why hdb prices drop -1% last year while condo prices went up 8%. Nobody will buy hdb older than 20 yrs unless the owner is desperate to sell cheap. The only way to earn money from hdb is to buy bto & sell immediately after 5 yrs. Or rent out and stay with parents. Isn’t he the Minister who burst the resale flat bubble with his open admission that the value of HDB flats will reach zero at the end of lease? If he should compete in the HDB heartland, he will likely be voted out. LOL! Ground could never be sweeter for PAP. Call for election now. This is a PAP apologist, it’s in the trait, after years of silly education. No one even cares about Lampar Wong’s background, only birds of same kind will harp over this. When an elite so out of touch, doesn’t even know mee siam NEVER has hum, how competence can he be? He must be having a life too good for himself, buying mee siam also had personal service. How can such a person understand the ground? You guys must be extremely naive to believe he is the best man for the job! he appears to have this ‘up yours attitude’ directed at sinkies when addressing them or talking to them. sinkies should do the needful at the ballot booth this coming GE. watch the way he talks in parliament vids. I think Singapore must wake up fact that going to Hwa Ching, ACS or RI is not the path to riches to them, rather is then path for riches to the Singapore government and its economy . The tuition effect is contributing to a few percentage of GDP. It makes good academics eg lecturer etc. Which only Singapore is paying a lot of money to hire. Also make a bunch of natural aristocracy. Only the foreigners outside knows as they are the enterprising lot that replaces our elite students in workplace . The whole system is sustained by believe . From elite school grad . YOU DO THAT, YOU LOSE YOUR PANTS FASTER, PAPpy is the real owner, you are only the tenant. It is state in your transfer document only seen by you AFTER YOU FULLY PAID UP – to late to escape of its deception. KNN: The only way to earn money from hdb is to buy bto & sell immediately after 5 yrs. Or rent out and stay with parents. As the real owner in law (which is why your lease value expires to zero) HDB will extract the “imaginary profit” by way of backdoor capital gain tax RESERVED FOR PEASANTS – it is called HDB resale levy. Indranee told peasants these – the owner gets to keep the profit from HDB resale. In PAPpynomics’s fake economy of asset bubbles, the resale levy must run in tandem to HDB resale price underpin by escalating BTO prices, HDB will eat up all your FANTASY IMAGINED profits on your resale – that is in substance a myth just like a puff of your cigarette smoke. DISINFORMATION HAS ALWAYS BEEN THE CORE MODUS OPERANDI of PAPpypolitics and PAPpynomics – it is just the 70% dafts too stupid to even begin to discover they are stupid to impossibility and got themselves CON-vinced of the politics of deception reminiscent of Mao’s fake undying love and heartache concerns for peasants/proletariat. It was PAST TENSE’s grandoise promise to the peasants (and world media to boot too) of home ownership of fiction heaven-on-earth utopia that must one day IMPLODED OF HIDDEN LIE in “truth” (fake news). And that only came AFTER HE HAS GONE TO TERN SUA NEVER TO RETURN TO BE CALLED OUT to account for his tall promise of fiction. Those peasants in China who died participating in Mao’s Long March must be very angry in their graves. Their children can’t vote in autocratic dictatorship. Xi Chiping is installed for life – much like Mao. How do the peasants in LEE-jiapore feels now? I hope it is SWEET AND REJOICEFUL!! That, I strongly suspect AND HOPE TOO, will be expressed loudly in the next GE. Excuse me, VJC a “neighborhood” school?! Yew really should get your head re-examined more properlee this time, yew f-ing sinister incester!! After you’ve managed to flush it back out of the toilet into which yew dunked your skull previously to save a few cents’ worth of money by not turning on the tap to use the shower head (do you even have one after losing your pants investing? ).